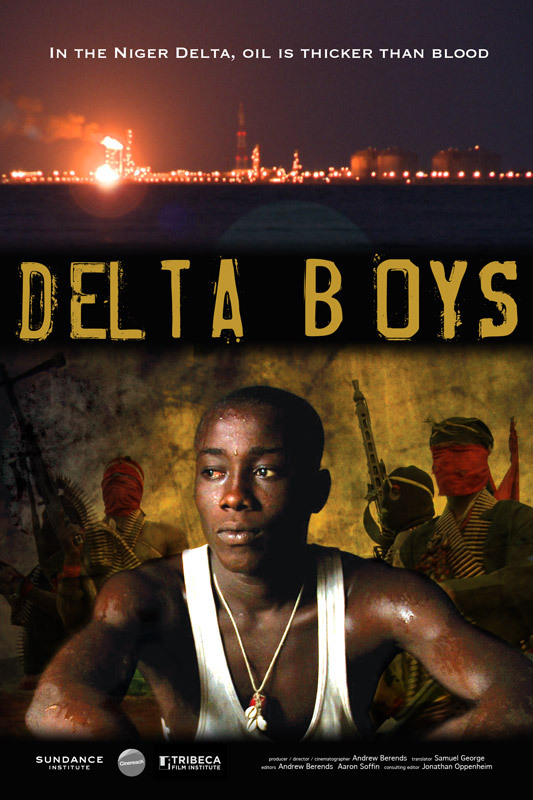 Film Poster for "Delta Boys" courtesy Filmmakers and Journeyman Films. "Delta Boys" is a must-see film about Niger Delta militant rebels who are fighting government and environmental oppression in oil-rich Nigeria. Award-winning filmmaker, Andrew Berends, who was arrested in Nigeria during the filming of this documentary, bravely crosses the lines of Nigeria's oil conflict to bear witness to the lives of the militants engaged in the bloody struggle and the civilians caught in the crossfire. Nigeria, Africa's most populated country, is the fifth largest oil supplier to America. So, no matter how far away this problem seems, it is something much closer to home than most of us want to believe. As we nervously watch the price of gasoline go up at the pumps, we try to forget where it comes from and at what cost. While focusing on the rebels living in the Niger Delta where hundreds of millions of dollars of oil is extracted every year, "Delta Boys" reveals the impoverished lives of all who reside in the Niger Delta. The area has been destroyed by the oil industry and the Nigerian government. 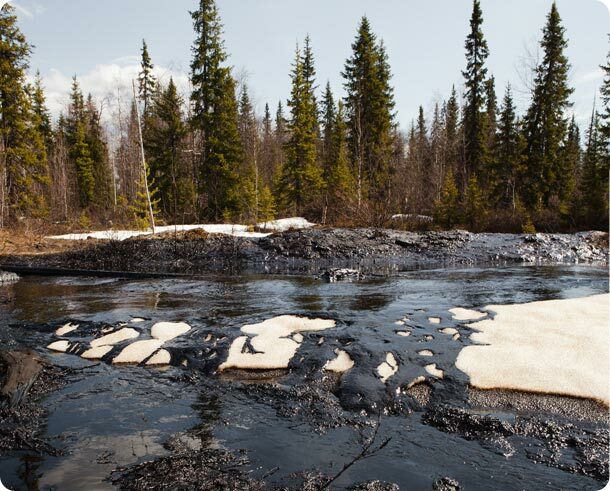 They turn a blind eye to the hundreds of oil spills that occur every year and the ongoing suffering of the indigenous population. Photo of Nigerian Rebels from "Delta Boys". Courtesy Filmmakers and Journeyman Films. It's no surprise that some have raised arms to rebel given the crimes perpetrated against them. The Washington Post reported that in December, 2011 about 40,000 barrels of crude oil leaked between a floating storage vessel and an oil tanker in a Royal Dutch Shell field off the coast of Nigeria. Reuters recently reported: "An oil spill near an ExxonMobil oilfield off the southeast coast of Nigeria has spread along the shore for about 15 miles, and locals said it was killing fish they depend upon to live." While I am not a supporter of violent protest, it's hard not to have some compassion for the rebels involved in the conflict. Nigerians who live on the Delta can't fish and live off the land as once they did. There are no schools. There are no jobs. There are no hospitals or healthcare. There are no adequate roads. Despite billions of dollars pumped, (or should I say pimped? ), out of the ground, oil rich executives and government officials seem not to be human enough to be concerned about the pollution, help the local population at all or share even a small fraction of the wealth. Perhaps the powers that be hope the common people living in the Niger Delta will just die off and leave an invisible wasteland while continuing to line their pockets with the dirty money from the oil industry. In the end, "Delta Boys" is a film not just about oil conflict in Nigeria. It is also a damning reveal about the international oil industry's devastating social and environmental policies across the globe AND the complicit, corrupt governments who partner with them to pump oil, no matter the social or environmental cost. Movie Poster for "The Big Fix", a seering documentary about the BP Deepwater Horizon Oil Spill in 2010. 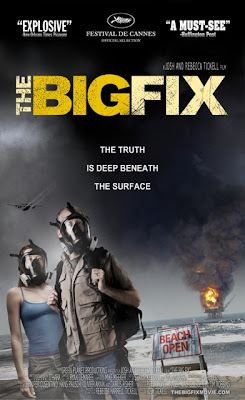 In the same vein as "The Big Fix", a masterful cinematic expose about the devastating BP Horizon oil spill in the Gulf of Mexico, and "Crude", a film chronicling the devastation wrought by the oil industry in Equador, "Delta Boys" is yet another wake up call for the world to encourage finding a better way to fuel itself. But, have we really heard the wake up call? I think not. Since the BP spill, there have been many more oil spills around the world and they all seem to go largely unnoticed despite being fully reported in the press. Did anyone really pay attention to the Spring, 2011 oil spill in the North Sea? Or, that a Spring, 2012 Natural Gas leak in the North Sea spewed a stream of toxic natural gas into the air for months and created miles and miles of a toxic poison "sheen" around the well? 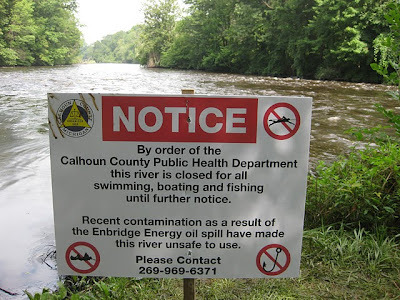 Closer to home, how many of us even remember that in 2010, after the BP Horizon Spill, a pipeline break in Michigan sent 819,000 gallons of toxic tar sands sludge sliding into the Talmadge Creek and Kalamazoo River? 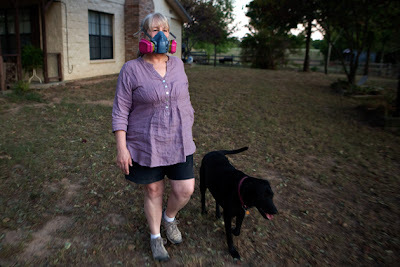 The LA Times reported: "Before the spill, many residents weren't even aware a pipeline ran through their community. And Government investigators concluded that the pipeline's Canadian owner, Enbridge Inc., knew about the crack that led to the spill five years before the accident." Is any of this teaching us a lesson? Seems like we're stuck in a kind of "Ground Hog Day" film scenario where we wake up and make the same mistakes over and over and over again. Recently, the New York Times reported: "In late August 2012, the Interior Department granted Shell permission to begin preparatory work on its first well in the Arctic Ocean, moving the company a critical step forward on its tortuous quest to drill for oil off the coast of Alaska." What are the likely outcomes of arctic drilling? A recent Moscow Times article might give an indication: "Spill Dumps 2,200 Tons of Oil in Arctic." The article detailed the shocking revelation that the Russian oil spill covered 5 square kilometers of the pristine arctic wilderness. And, what's more frightening, Greenpeace estimated that 5 million tons of oil leak from Russian pipelines and in accidents every year. This is the equivalent of seven disasters on the scale of BP's Deepwater Horizon spill in the Gulf of Mexico. Just one of many oil spills in the Russian Arctic. Pic via Greenpeace. Despite significant, substantial efforts by the Obama administration to embrace renewable energy, the U.S. national energy policy is still primarily dominated by the oil and gas industry. Pro oil and gas policy is encouraged by both sides of the political spectrum. In addition to opening up the (melting) Arctic for drilling, there's a rallying cry for more and more dangerous drilling including more wells in the Gulf of Mexico, a push for more dangerous fracking for natural gas all over the country and the building of the giant XL pipeline through the heart of America to pump in the dirtiest oil on earth from the tar sands in Canada. Susan Connolly, a Michigan resident, was impacted by the Michigan 2012 oil spill which, despite being huge, was overshadowed by the larger BP Spill. In the LA Times report, Ms. Connolly related that she became a health advocate after her children, 2 and 4 at the time of the spill, started throwing up and developing rashes when the spill hit less than a mile from their day-care center. Isn't it time we all become health advocates? Ed Cake, a biological oceanographer, made an important point about the cumulative effects of all the pollution coming from the oil and gas industry. In a recent article about the continuing effects of the 2010 BP Deepwater Horizon oil spill entitled, Seafood Deformities Suggest Impact of BP Oil Spill Worse than Imagined, Cake explained the lingering implications of the spills we too easily forget. He said: "It has been more than 33 years since the 1979 Ixtoc-1 oil disaster in Mexico's Bay of Campeche, and the oysters, clams, and mangrove forests have still not recovered in their oiled habitats in seaside estuaries of the Yucatan Peninsula. It has been 23 years since the 1989 Exxon Valdez oil disaster in Alaska, and the herring fishery that failed in the wake of that disaster has still not returned." Next time you fill up the tank at the gas station or light up a propane-fueled barbecue grill, please remember Susan Connolly in Michigan, the residents of the Gulf Coast, the impoverished Nigerians on the Niger Delta and the many communities around the world already impacted, negatively, by oil and gas drilling. A national political policy that is Drill Baby Drill is, effectively, really Spill Baby Spill. Susan Connolly forewarned: "I hope other communities will learn how we've been impacted here in Michigan. There will be other spills. It's not a matter of if, but when." Whether you are a Democrat or Republican, it does not matter. The toxic legacy of the oil and gas industry continues to haunt us. From the Niger River Delta to Dimmock, Pennsylvania, Michigan to the North Sea, the Arctic to the shores of Louisiana, we ALL are Delta Boys. No matter your political persuasion, sticking your head under the tar sands and pretending how we fuel the planet doesn't effect us really isn't going to work anymore. The film will premier October 16th on leading digital platforms and storefronts through Sundance Institute Artists Services Program and Cinedigm Entertainment Group. Fine article as usual. Thanks for highlighting this important issue. The US gets about 5% of its oil from Nigeria - about the same amount that we get from Mexico or Venezuela. Oil production from Cantarell, Mexico's giant oil field, is falling rapidly. I've seen a number of articles suggesting Mexico will cease exporting oil in the next few years. That's 5% of our oil. Never mind how morally compromised our Nigerian oil imports are, remember how vulnerable they are to insurgent disruption. And recall that the other major sources of our oil are vulnerable to their own unique threats, let alone geological depletion. It's time to start preparing for declining supplies of oil, whether it takes place sooner or later, gradually or abruptly.